The ultimate professional break-in oil. No-compromise formula for fast and effective ring seal and valve train break-in. Shock absorption technology to protect bearings and piston skirts. Formulated with 2500 ppm of Cam-shield® Premium ZDDP. Prevents air bubble formation for bearing protection. Formulated to neutralize contaminants, keep engine parts clean, and prevent corrosion in engines subject to storage. Kinematic Viscosity at 100C = 19.3 cSt. Colored blue for visual identification. 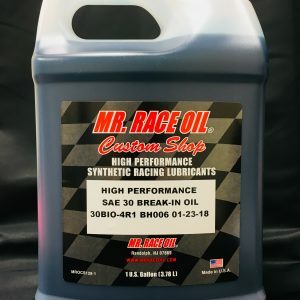 Full synthetic break-in oil engineered specifically for break-in of high compression pro-stock engines with tight bearing clearances, dry sump oil systems with high pressure engine inlet feed, and low-friction piston rings. Formulated with 2500 ppm of Cam-shield® Premium ZDDP. Shock absorption technology to protect bearings and piston skirts. Prevents air bubble formation for bearing protection. Formulated to neutralize contaminants, keep engine parts clean, and prevent corrosion in engines subject to storage. Kinematic Viscosity at 100C = 3.7 cSt. Colored blue for visual identification.